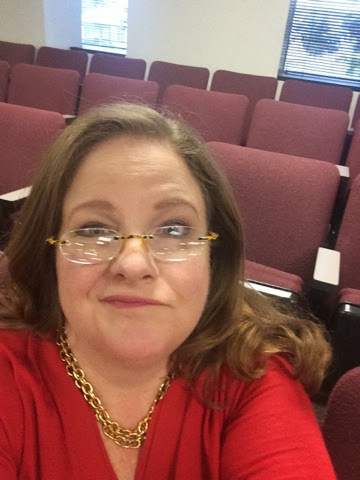 Paige McDaniel's Blog: Jury Duty, Baby! Well, I'm downtown at jury duty this morning. Seems like most people I know are usually bummed about serving. Not me. I like serving on a jury and have done so 2 times, maybe 3. I love America and I think the right to a trial by jury is one of the most important parts of our government. NOTE: I even served on the Grand Jury for 3 months, M, W, F -- foreman, suckers! The part that isn't so fun is getting up, heading downtown, then participating in the process of what my mom calls "hurry up and wait" -- the time spent sitting in the jury room waiting to be called. The jury room is an unusual place. I think I end up getting called for duty about every other year or so, so that means I've sat in this room (or another one if at a different courthouse -- Crowley today) in my adult life about 20 times. I like to sit in the back of the room and study the people. It really is a pretty good representation of our population -- but I think a bit more Caucasian than Dallas County is in reality. But today is different for me. First, a friend and neighbor of mine just walked in -- hi, Carolyn -- and I don't want to be picked. This is just not a week I can serve and the last time I was on a jury it took a week. I cannot return tomorrow, as Community Partners of Dallas has me busy as a bee this time of year. 1. I'm ready to raise my hand high during voir dire and tell them and what I really think. 2. I'm wearing a red top and gold jewelry. NOTE: Do not ask me about the attire -- just following direction from others! I imagine that if the case is about child abuse or domestic violence, I'll certainly be let go. But, no telling what the case will be. I'll let you know what happens -- and I promise that I will serve the next time I'm called. And I'll wear blue. I just did something I never wanted to do.